For the 1939 World’s Fair, city agencies were invited to produce exhibits for the New York City Pavilion (now the Queens Museum of Art). The Department of Water Supply, Gas and Electricity (a New York City Department of Environmental Protection predecessor agency) commissioned the Cartographic Survey Force of the Works Progress Administration to create the magnificent Relief Map of the New York City Water Supply System. Work began in 1938 and a team of map builders toiled over the map with an immense depression-era budget of $100,000.00 (roughly $1.5 million in today’s dollars). At 540 square feet the planners could not allocate enough space for the map in the city pavilion resulting in its elimination from the World’s Fair. Ten years later, it made its first and only public appearance at the city’s Golden Anniversary exposition in Manhattan’s Grand Central Palace. After decades in storage, the 27-piece map was in desperate need of conservation. 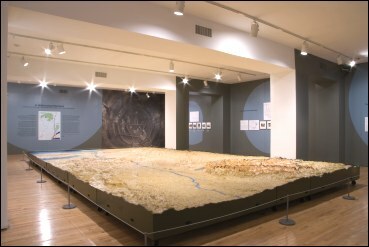 In October, 2006, the New York City Department of Environmental Protection and the Queens Museum of Art sent the monumental Relief Map of the New York City Water Supply System to McKay Lodge Fine Arts Conservation Lab in Oberlin, Ohio for restoration. Now, in time for its 70th anniversary, and the 100th anniversary of the inauguration of the Catskill System construction, the map has been restored to its original brilliance and has arrived at its intended home in the New York City Building where it will remain on long-term loan. Learn through images how conservationists brought the mammoth relief map of the water supply system back to its original grandeur. New York City has the largest unfiltered surface water supply in the world. Every day, more than 1 billion gallons of water from this vast system is delivered to eight million New York City residents  an amazing accomplishment. Visit the links below to learn more. Funding for the exhibition "A Watershed Moment: Celebrating the Homecoming of the Relief Map of the New York City Water Supply System" and the conservation of the relief map has been provided by the New York City Department of Environmental Protection through the New York City Department of Cultural Affairs. Additional funding provided by the New York State Council on the Arts.